High School Band Performed at the MACC 4/16! High School Band Performed at the MACC! 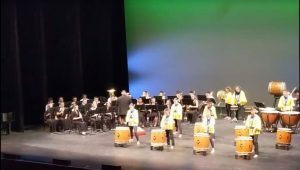 Congratulations to Mr. Yamashita, Mr. Nakoa, and all the musicians in the band on a wonderful performance! Enjoy the highlights below. 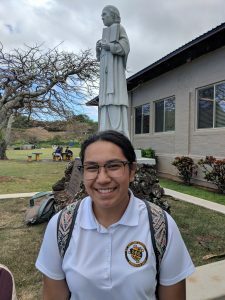 Three students represented St. Anthony School at the annual Hawai’i History Day Event on Saturday April 13th: Noah Dods, Senior Documentary Category, Che Ann Purdy, Junior Exhibit Category, and Anela Warren, Individual Performance Category. Congratulations to them all for their hard work and making it to this State Competition! A very special congratulations to Che Ann for receiving the Robert Douglas Memorial Award for her project: “Okinawan People: Survivors of War and A Model of Peace”!! Che Ann Purdy, Happy, deserving recipient of an $150 award! Join us in the Castle Theater to enjoy the music of St. Anthony High School Band! 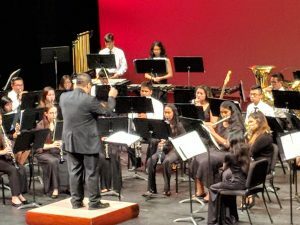 This is a concert that is part of the school band performance series hosted by the Maui Arts and Cultural Center that allows the next generation of musicians to experience the same world-class stage setting that the superstars enjoy. The public is invited to attend and support Maui’s hard-working young performing artists at this FREE concert! Trojans Baseball Team wins one game against Seabury Hall! 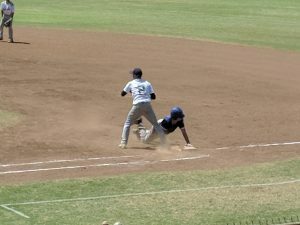 First Baseman, Geste Ornelles pictured above attempting to get the Seabury Hall runner out. 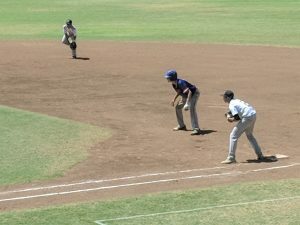 Trojans Baseball Team beats Hana. Welcome back Hana! Join us at the Fun Daze Bazaar! St. Anthony Ohana – Remember to SIGN UP for a volunteer shift. St. Anthony School will be closed in celebration of Good Friday and the day after Easter Sunday on Friday April 19th and Monday April 22nd. We wish everyone a Happy Easter Sunday! Trojans Basketball Team vs. Lanai highlights. 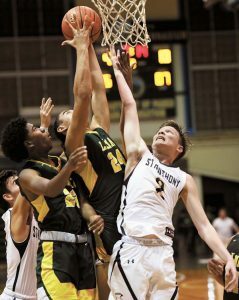 Lanai’s Devrene Kahananui Alejado grabs a second-quarter rebound between St. Anthony’s Kaimana Baker and teammate Andre Adams. 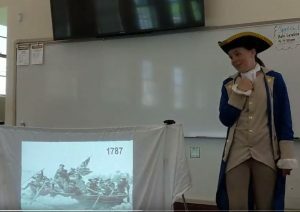 Gearing up for Summer and the upcoming school year! Click the links below for our book lists!